Dis less a movie den it be a student film project gone terribly wrong. Poor akting, lame dialogue, weak direktion, and cheap produktion values be de least of it’s problems. No, biggest issue monster have wit Superheroes Must Die be it’s unforgivable stoopidity and fakt dat it make about as much sense as Lost in czechoslovakian. 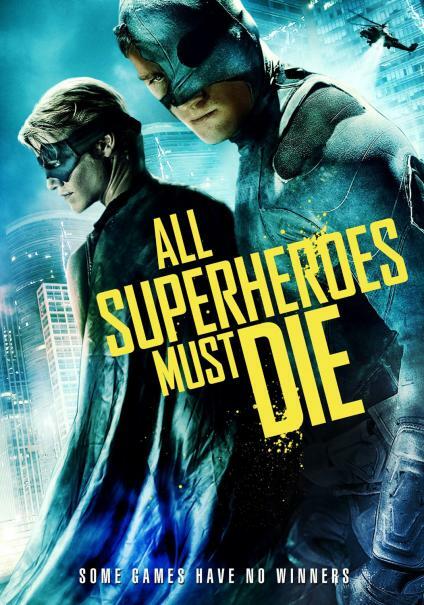 Group of superheroes wake up in remote town minus deir superpowers. Foursome made up of bad aktress, bad aktor, worse bad aktor, and bad aktor who spend entire movie walking around wit half a mask because it got torn and he can’t be bothered to just take it off. It turn out dis situation compliments of arch-villain, Rickshaw. Yes, he be named after a two wheeled passenger cart for trotting tourists around. “But how dis possible?”dey ask. Rickshaw supposed to be dead. How he capture dem? What he do to dem? Don’t hold your breath waiting for any answers. Thru a series of video recordings, Rickshaw inform “heroes” dey must perform series of tasks in order to save hostages. If dey refuse to participate, whole town rigged to blow! So, basically, dis entire movie based on classic “stoopid villain” premise. You know what me talking about. Instead of just killing de hero, villain has to create super elaborate set-up for entertainment purposes. In dis case, his NOT ours. Heroes have to split up into two teams. 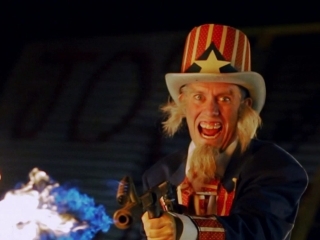 One team end up having to fight egregious over-aktor dressed up like Uncle Sam. Dey rush him and he push dem down. Really hard me guess because dey mysteriously incapacitated. Uncle Sham pull out knife and stabby-stabby worse bad aktor. Meanwhile, other team have to split up. While one guy fight skinny circus strongman on trampoline, other have to save hostages strapped to explosives. He attempt to save dem by putting out fuse wit his fingers. It not work (obviously) so he use axe to cut end off fuse. Whew! Dat was close! Only, for some reason, fuse light up again. What can dey do? Use axe again? Maybe yank fuse out of explosives (monster’s first choice)? No. How about run away and let hostages explode? Second group meet up wit first group and Half-Mask plow into Uncle Sham, demonstrating dat he de only one who got to keep his super powers. Super strength! But it later revealed he didn’t lose his super powers because he never had super powers to begin wit. Even tho…er…he supposedly super strong. Anyhoo, it too late for stabbed guy. At dis point, remaining heroes finally get around to checking in on second group of hostages. Who also get blown up. Heroes realize it not matter what dey do because Rickshaw going to blow up hostages anyway! We mistreated to maudlin flashbacks in failed retroactive effort to make us care about dese charakters. Back in his hideout, villain do de old “cross out dead character’s picture wit red marker” gag – and cackle. Oh, how he love to cackle. Remaining tree heroes show up at second spot where another tree hostages rigged up to blow. Also in room are a gun and tree coffins wit deir names on it. Only tree coffins because, according to one hero, Rickshaw guessed other hero would already be dead after not completing last task. Uh, right. Dat and produktion not able to afford turd wooden box. Rickshaw tell dem dey must kill demselves to save hostages. Half-Mask grab gun, step up to his labeled coffin, and put gun up to his chin. It look like he about to kill himself. But, instead, he shoot hostages! Dis be a very surprising moment because…it make absolutely no sense! Why he pretend to shoot himself first? Not for benefit of hostages because dey hooded (so dat produktion can save on extras and re-use same tree aktors). What de Fudgee-o? Dey rush off to next stop where one of heroes’ sisters rigged to blow up. Rickshaw tell dem dey must kill each other and he will let sister go. Of course, at dis point, we already know Rickshaw not letting anyone go. He already killed all de hostages. Heroes already stated he already going to kill all de hostages anyway. So time to try and save hostage instead of playing useless game, right? Right?!! Nope. Brother suddenly and mysteriously very bitter about fakt he be a sidekick. He get himself killed. Presumably to save his sister. And – surprise surprise – she get blown up anyway. In final round, Half-Mask and girl superhero must fight to death. Half-Mask seemingly kill himself but it really only a ploy to help him triangulate Rickshaw’s position. Uh, how he do dat? By pulling out a map, connecting a bunch of x’s, and deducing point of intersektion be Rickshaw’s hideout. Me repeat: WHAT DE FUDGEE-O?! Hey, buddy – viewers suffering A LOT more. Half-Mask beat up a bunch of henchmen in bear suits. Why dey wearing bear suits? Because it make dem look more fearsome? He get drop on Rickshaw and shoot him. But, wit his last dying breath, Rickshaw pull out remote and trigger timer dat will blow up entire town in tree minutes. A badly wounded Half-Mask check out security monitors and notice girl superhero. Instead of eskaping town, she race to other place and locate Half-Mask’s ridiculous “triangulation” map. She end up finding him. As timer tick down, dey limp out of HQ. Sadly too late to save demselves, but happily right on time to save US from crappy sekwel. A cheese omelet stuffed wit stoopidity. Dis movie aktually make Monster nostalgic for Supergirl. Verdikt: Worst Superhero Movie Ever! Rating: 0 chocolate chippee cookies.